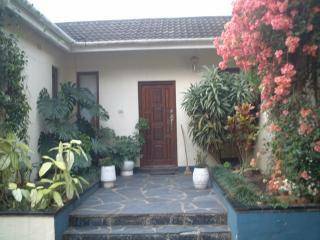 5 Bedroom home - 450sqm on a Secure Golf Course Estate. Pool and Garden. Our home is a beautifully decorated house overlooking the 6th and 7th Fairways of the Golf Course that we live on. We have a huge entertainment patio, with pool outside, and gas Weber. The patio holds a lounge suite as well as a 12 seater dinner table. We have a TV room/Library with Plasma screen, a childrens playroom, dining room, seperate formal sitting room, as well as the Bedrooms. There is also a large office upstairs from where I work. We have ADSL internet connections as well as a fully equiped office. All the bedrooms have double beds and are airconditioned. There is a Loft Guest suite over our double garage, with bathroom and kitchenette. Also with TV, DVD facilty etc. Our Kitchen is open plan and opens into the dining room. There is a trampoline in the Garden. One walks straight out of the Garden onto the Golf Course. One is permitted to walk, run, cycle, roller blade on the Golf course paths. We employ a maid that comes in to clean the house and do the ironing and washing etc, every day. This facility would be included in the swop as the house is very large to try and keep clean onesself. Gladys (the maid) has been working for us for the last 10 years and is very discreet and trustworthy. We are a family of 4. Myself, Barbara and my husband Keith and our two daughters, Gabriela, aged 10 and Alessia aged 8. My husband owns a Property Development company and I own a Medical Agency that supplies surgical products to the Hospitals. Our children are at a local Private school which is also situated about 5 minutes away from where we live. We have travelled extensively and also go on snow skiing trips regularly in Austria. My parents currently live in Los Angeles as my Father is the South African Consul there. We are particular about how we look after our things and expect the same from others. Our neighbourhood is within a Security Golf Gourse Estate. Access is only granted with a security card. 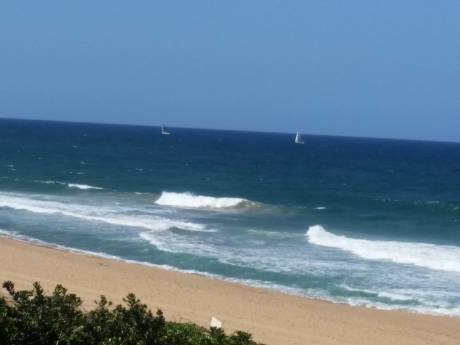 We are a five minute drive to the local beach in Umhlanga which is the premier beach resort on the Natal North Coast. As we are on a Country Club Golf Course Estate, there are also tennis courts and Community centres for use. We use a our golf cart a lot to drive around the Estate. The area is very lush, green and tropical looking. We have high humidity in the Jan - March period. There is a massive shopping Mall situated about 3 minutes drive out of the Estate. Just outside the gates of the Estate, (500 m) there is a filling station with take away facilities, 24 hour Luxury Food Outlet and convenience shop. Opposite that is a Spar with a Deli, open 7 - 7. Durban is about a 1 1/2 hour drive from the beautiful midlands with Meander routes. The Famous Drakensburg are also only 2 1/2 hours drive away. Durban is South Afria's biggest Port City. 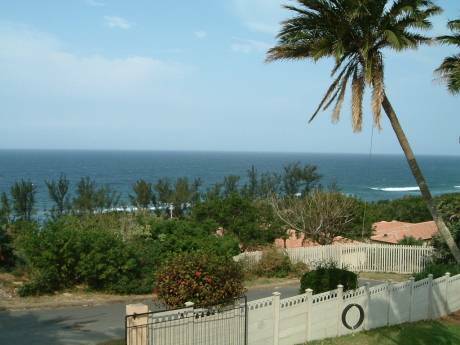 Kwa-Zulu Natal (the province) is very green and lush with rolling green hills and spectacular coastlines.